So, Margaret Thatcher’s funeral is tomorrow and although I object strongly to the changes that Margaret Thatcher oversaw while Prime Minister, I can’t bring myself to celebrate the death of an old lady. I don’t, however, particularly object to others doing so. I agree with something I heard on the radio which was that we should, ideally, be making a distinction between protesting against Thatcherism and celebrating the death of an old lady. What I do disagree with is the decision to give Margaret Thatcher a Ceremonial Funeral with Full Military Honours which, as far as I can tell, is essentially a State Funeral in all but name. Amazingly, I agree with Peter Oborne in the Telegraph who writes that This is a State Funeral, and that’s a Mistake. Essentially the UK is a parliamentary democracy with a Head-of-State (the Queen) and a Prime Minister who is an elected Member of Parliament who also happens to be leader of the dominant party in parliament. This then allows this person to form a government and to run the country. Simply being Prime Minister should not guarantee a state funeral (I appreciate that Margaret Thatcher’s isn’t, technically, but let’s accept that it essentially is). We do not need to respect this individual or hold them in high esteem. They are simply a politician who is also the leader of a party that essentially won an election. State funerals should be for heads of state and others who are genuinely held in high esteem by a significant majority of the population (or at least that’s who I think they should be for). According to what I can find on Wikipedia, there have only been 12 non-royal state funerals since 1586 and this would be the first non-Royal Ceremonial Funeral since 1953. Those getting state funerals in the past does include some Prime Ministers, Churchill being the last to get a state funeral when he died in 1965. I don’t think it is fundamentally wrong to give a state funeral to someone who has been Prime Minister, but it should be the exception rather than the rule. So, what makes Margaret Thatcher’s premiership exceptional. She was the first woman Prime Minister, but I suspect that many would argue that she did little to promote the equality of woman in the workplace. I certainly feel that she was an exceptionally strong and motivated person who succeeded despite the obstacles that she faced, rather than someone who paved the way for others in the future. She led the country during the Falklands war, so maybe that’s enough but I’m not really convinced. Essentially I think that a state funeral should be to honour and pay respects to someone who was generally regarded positively and regarded as having been, in some sense, exceptional. It shouldn’t be simply because they were the first female Prime Minister, or because they happened to be Prime Minister during a war, and certainly not because some core of the dominant party in Westminster happens to revere them. This feels more like we’re being told “you will pay your last respects whether you like it or not”, rather than something that genuinely reflects the feelings of a majority of the population. Maybe history will look kindly on Margaret Thatcher and those who strongly oppose what she did while in power, will be judged to have been wrong. Maybe she will be regarded, in the future, as one of the best Prime Ministers. That, to me, isn’t really the point. It is clear that the country, today, is heavily divided regarding Margaret Thatcher’s legacy and to decide to give her a state funeral despite this seems unfortunate. It seems as though the Tory party hardliners are quite happy to thumb their noses at all of those who feel that they have suffered due to the policies introduced by Thatcher. I had always assumed that despite different views on how best to run a country, most in government would like to do things that bring us together, rather than divide us further. It seems to me that deciding on a state funeral for Margaret Thatcher is a funny way of doing this. I also think it makes it much harder to criticise those who protest at the funeral. If there had been a private funeral for family and friends to pay their last respects, I would regard protests as unacceptable. We should allow a private individual to be laid to rest in peace. Given that this is essentially a state funeral paid for with taxpayers money, I see no reason why protests aren’t entirely valid. Part of me hopes that the government doesn’t live to regret this decision, but another part hopes that this is a turning point where people start to recognise the true motives of those in power and start to do something about it. With a blog name like To the left of centre, you might imagine that I would write some gloating post about the death of Margaret Thatcher, but I can’t quite bring myself to do so. I’ve only written about her once before, when I commented on the large increase in income inequality that occurred during her time as prime minister. Something that has struck me, while listening to the various people commenting on her life, is that very few (if any) seem to say anything really nice about her. Many thought she was “strong”, “decisive”, “inspirational”, “determined”, “a great polician” but noone seems to have said “nice”, “cheerful”, “friendly”, “generous”, “compassionate”. Listening to radio 4 on the way home last night, someone – when asked if she could have done some things differently – suggested she could have bullied her staff and colleagues less. Someone tried to say something positive by commenting on how she would sometimes change her mind. He went on to say that you could arrive one morning to discover that her views had changed and that she now agreed with what you had said the previous day. She wouldn’t acknowledge that it had been your idea; but it still felt good to have contributed! Sounds like a remarkably unpleasant person. It’s possible that this was the only way that a woman could ever have become prime minister at that time, but that doesn’t suddenly excuse her behaviour. It just just doesn’t reflect well on our society, which is probably no better today to be honest. All I seem to be able to take from the coverage of Thatcher’s death is that she seems to have been quite an unpleasant person who divided a nation. Still, some think she was one of our best prime ministers. If my characterisation has some merit, I find it hard to understand how this can be true. 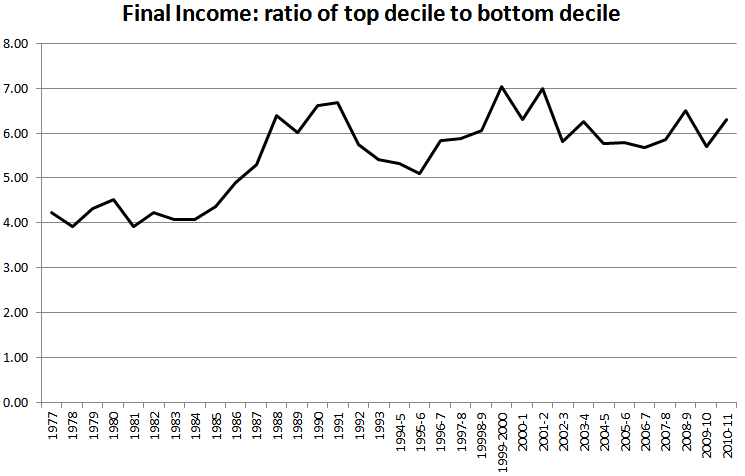 The figure below is one I found on the Liberal Conspiracy’s website in a post about the need to address Thatcherism. The figure comes from data provided by the Office for National Statistics and shows the 90:10 ratio from 1977 till 2011. This ratio is one way of indicating income inequality, something I’ve written about before. Another is the Gini index. Basically this figure shows the ratio of the income of the households in the top 10% of earners to those in the bottom 10%. It includes all taxes and benefits and (I believe) is based on the average for each decile (i.e., it is the ratio of the average net household income for the top 10% of households to the average of the bottom 10% of households). It is clear that it has risen substantially since 1977 (something that is also indicated by the change in Gini index over the same period). What I find most surprsing is the sudden jump between 1984 (when the ratio was 4) to 1988 (when it exceeded 6). This was smack bang in the middle of Thatcher’s reign as prime minister. No wonder she’s so disliked by those on low incomes. The 90:10 ratio for the UK from 1977 till 2011.